My passport has run out of pages, and the airline insists the Japanese need enough room to plant their larger than normal entry stamp/ visa on arrival. They’re refusing to let me board my plane! I’m saved only by the fact that the page with my Chinese Visa, has no stamp on the page itself, allowing me to gently pull off the affixed visa and re-present a passport with a blank spot. The bureaucrats quite nearly extracted a significant pound of flesh from me. Upon arriving in Tokyo, my first step is to go to the train station and present my voucher for my pre-paid one week JR (Japan Rail) pass I purchased in America. I had to carry the voucher around with me for months before getting to Japan, lose it and I would be out not only the $300 or so I paid, but additionally having to shell out in excess of $100 per ride in addition. The passes are only available overseas, and proved to be a wonderful and highly unusual moment of pre-planning for a guy who once tried to ride through Laotian quick sand on a bicycle. An electronic sign announces the appointed arrival time of the train taking me to Kyoto. 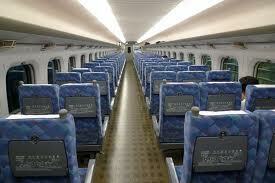 The Shinkansen (the name of the Japanese high speed train line) is never tardy. I mean, if that train gets in 2 minutes late, it’s considered a national disgrace; the entire nation literally walks around with their head held low in penance for several days. 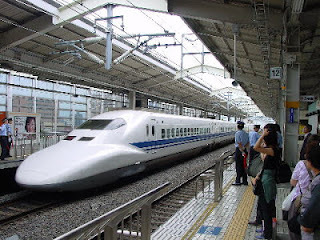 The Shinkansen is an incredibly efficient form of transportation, immaculately clean, and travelling in stretches at 180 mph, you reach your destination in a hurry. The fact that such high speed rail exists over much of the industrialized world and not in America does not sit well with me. Each and every single ride I took in Japan was quite comfortable and quiet, making the trains I have taken through Eastern Europe and SE Asia a hazy laughable memory. I'm gently dreaming of this train's distant cousins as we gently decelerate, and pull into Kyoto station. 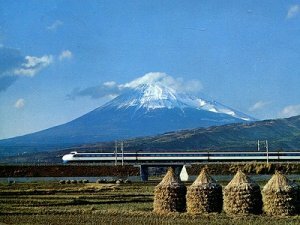 On the whole, the Shinkansen was the best way I have ever traveled around a country, and if you are going to Japan, and want to see it easily and inexpensively, then truly, you MUST get a JR Rail Pass before heading over. That would be my #1 travel tip for Japan.